Baseboard Register 15" x 13"
Brand new, economical, gravity-type registers! Common years ago, central gravity furnaces are not made anymore, but the antique painted over, bent, broken, heating vent covers remain. These hard to find baseboard vent covers have been discontinued years ago by other manufacturers. 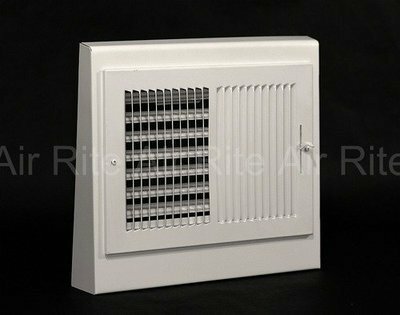 Air Rite is proud to offer this new product! These attractive, multi-valve dampered, steel register covers are a clean white color, with a professional enamel finish. They come complete with mounting hardware and are made in the USA*! 15" wide x 13" high for a 12" x 8" duct. 2 1/4" deep at the base and 1" deep at top. See the Product Info Sheet for all dimensions & more information.